Navigating the villages and byways of Northern Thailand: A journey back in time to another world. I parked the jeep on a hilltop that commanded a sweeping view of the surrounding hills and valleys. The scenery is stunning, breathtaking, but that is only a tiny part of what is about me. Nothing but the rolling hills and valleys is visible. No villages, no modern amenities such as power lines, nothing. I could easily imagine if I had dropped the jeep into one of those ditches I'd be in serious trouble. I may not even be discovered for a week or more. I parked because the road ahead is impassable. During and after the rainy season this is often the case out in the hills. The roads are maintained by the local villagers on an 'as needed' basis. From what I could tell, there has been no four wheel vehicle on this section of road for over two weeks. The lamyai, longan and lychee have been harvested. 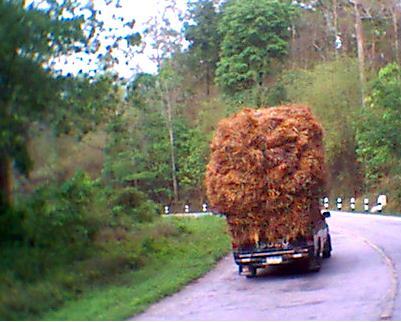 There will be no need to repair the roads until the rice harvest. Rice? There are no rice fields visible. There aren't even any villages. My sojourn, which has taken me over two hours to reach this desolate place, has been in vain. The small gulleys the rains have carved in the road that the jeep has been straddling for the past half hour have widened into canyons that nothing short of a crawler could navigate. But not in vain. For I had no intention of just passing through this ancient remote world. This world is entirely different from the hustle and bustle of the cities and outlying towns. So different, if you just simply drive through it you will miss much of it's wonders, it's magic. The passage of time here is a part of what sets this magical world apart. One cannot go too slow, for the life of this world is not measured in hours, nor in kilometers. It is a strange mystical world that has to be felt, absorbed, by the slow passage of the seasons. My first visitors are three children who have apparently popped right out of the ground. I have been waiting for them. It's almost impossible to go anywhere in Thailand and not encounter children. I asked them where they are going. One of them, at least, speaks Thai. They are hill tribe, at a guess, Lahu. They obviously had no intention of going anywhere. They no doubt heard the jeep and came down to the road to check out the excitement. I asked them where their village is, but not in distance. That is a common mistake the tourist makes when visiting the remote Thailand. Most people out here only measure distances in the time it takes to travel from one place to another. It is easy to make the mistake of asking a local person how to find a place and how far it is away and end up getting hopelessly lost. Many such inquiries will get you the knowledgeable reply of some period of time but you need to take into account how the person came to that figure. More often than not it will have been reached by someone who only notes time by the passing of the sun and who has only traveled that route on foot, bicycle or motorcycle, often traveling on paths a vehicle couldn't possibly travel on. I tested this once when I asked an elderly gentleman how far away a temple was and he assured me it was only twenty minutes. By jeep, it took 45 minutes and there was no way I could have done the trip in less time. The gentleman however had the trip measured in how long it would take him to snake his way through the rice fields paths on his bicycle. The children informed me the village was about an hour away in a vaguely northeasterly direction. I was certain there were other villages in the area, though invisible to me. The kids must have hurried out to the road to catch sight of the jeep and these were definitely jungle kids. Thus their village was probably 4 or 5 kilometers away. A jungle kid can easily travel 20 to 30 miles in a day though the average tourist trekker would be really lucky and in excellent shape to travel half that distance. I had found that out the hard way on more than one occasion. The children wandered off and I relaxed into my new world, time outside of time, as I waited for the next entertainment. About fifteen minutes later it showed up in the form to two middle aged hill tribe women. They both casually carried the hook shaped machete which no self respecting forest dweller would be without. One had a basket backpack arrangement on her back which was half full of gleanings from the forest. Various vegetables and mushrooms could be seen within. They offered me cold hard looks but I knew different. Over the years I had come to know this other Thailand. Had come to love it's slow measured pace and wonderful people. I inclined my head, gave a warm smile and greeted them in Thai. My smile was instantly returned and they asked if I was stuck. I told them no and they went off down the road. Next came an attractive tribal woman in her twenties. She too carried a basket on her back. It was nearly full to the brim packed with small sticks. These were trimmings from longan trees and used as kindling. I knew the sticks were abundant so her village must have been close by. So now we had at least two villages in the immediate area. I greeted her and we exchanged smiles. My next visitor was a monk. He came up out of the forest after having negotiated a steep slope off to the south. As he paced down the road I knew my entertainment would be minimal. His robes, though clean, were threadbare and had been primitively repaired upon more than one occasion. He was undoubtedly a forest monk. He kept his head bowed and from his slow measured pace I could tell he was undertaking walking meditation. I didn't exist as he passed me and I did not disturb him though I properly bowed my head as he passed. I mused as he made his way off down the road. It was quite likely he had no idea where he was, in any distances that a person from the modern world could relate to. In keeping with my timeless world my next visitors took over an hour to arrive. I knew they would come eventually so I whiled away my time inspecting spiderwebs and the local fauna. I was in caterpillar country and the forest around me was thick with undergrowth which was very well populated with our fuzzy friends. Very hazardous for the average casual visitor. If one wanted to travel far in this area it would be very wise to hire some of the local children. Many of those caterpillars have highly irritant venoms or poisons in their spines. Just brushing up to one could mean a week of painful itching rashes. Send the kids out in front to brush the caterpillars and webs out of your way. My last visitors were a sad note in a way. When I saw them I knew my idyll would be cut short. A pair of monks came walking up the road. In this timeless distant world there are a few vague rules that one should follow. The rules which assured me that if I had turned the jeep over or got fantastically stuck that I would receive help even in this remote corner of tropical paradise. People always help other people out. Very often, if you do get stuck out somewhere, you will discover you will get inundated in help. I knew the monks were either going into town or to another temple by the serious pace they had set. I greeted them with the proper wai reserved for monks and made the normal offer of a wave at the jeep and the query, "Want to ride?" Without a word they both climbed into the jeep while I took my last look at the ancient timeless world of the remote Thailand hill country. For those who wish to discover this amazing world, one must keep in mind, just traveling through it is not enough. Take your time and discover. Let the moments become an hour or two. Let the local people and the world about discover you.